Young? Looking for opportunities? Move to the capital! This is the clear conclusion to be drawn from the European Commission’s 2015 Youth Report. 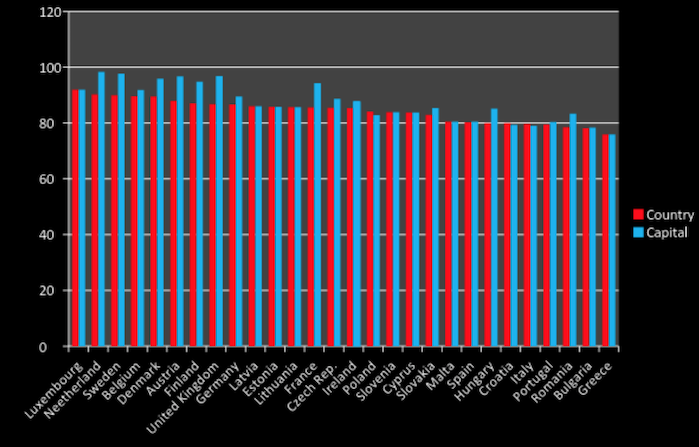 According the Youth Development Index, all European capital regions (with Lazio in Italy as the only exception) score better on youth friendly performance compared to the averages of their respective countries. In some cases, the difference between country and capital is more than 10 points on the scale. The Youth Development Index is an aggregate indicator that aims to show which regions in Europe are more ‘friendly’ to their young inhabitants (from ages 15 to 29). The indicators include several parameters such as youth population, educational index and employment index. The conclusion for youths is clear: capitals are the place to be. A reason behind the trend is the fact that capitals (especially in countries like the United Kingdom and France) are able to attract more investment from the private sector. It comes as no surprise that the capital regions score higher than the national level. But no rule without exceptions. As our graphic shows, For the smaller countries where the capital region is very dominant – i.e. in Estonia or Luxembourg – the capital and national level even out. Lazio, the capital region of Italy, even falls in lower than the national average. This is one of the consequences of the economic and social division between the North and South of Italy. In fact, according to EUROSTAT, the best region for young people is Bolzano.